Welcome to the Gifted Issues Discussion Forum. We invite you to share your experiences and to post information about advocacy, research and other gifted education issues on this free public discussion forum. CLICK HERE to Log In. Click here for the Board Rules. 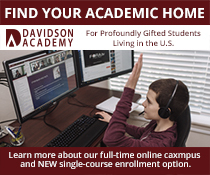 Learn about the Davidson Academy’s online campus for profoundly gifted students living anywhere in the U.S. The Davidson Institute is on Facebook, Twitter and YouTube! 2 registered (madeinuk, KJP), 0 Guests and 292 Spiders online. We have received quite a few public requests from parents in Australia recently, and we decided to create this part of the forum to provide a starting point for those directed to this forum. Please feel free to post here if you have anything to add. Also, feel free to create a new thread for any other country or region. GERRIC at University of New South Wales (https://education.arts.unsw.edu.au/about-us/gerric/) is one of the leading gifted education research organizations and they offer programs for gifted students (https://education.arts.unsw.edu.au/about-us/gerric/for-gifted-students/). Possibly some from the forums may also be interested in the yahoo group? Can those of us in NZ share? Of course! Feel free to post in this thread or start a new one. Generated in 1.057 seconds in which 0.014 seconds were spent on a total of 13 queries. Zlib compression enabled.